St. John's Metropolitan Community Church began as a small group of individuals who came together on the last Sunday in February, 1976, to study the Gospel of John. We are a Christian church that embraces the basic doctrines of Christianity. We confess Jesus Christ as Lord and Savior, and seek to encourage one another to live in accordance with Jesus' teachings. Beyond these basics, however, we leave it to each individual to work out the details of the Christian faith in accordance with her or his interpretation of Scripture. At St. John’s MCC, we seek to create an environment where each person is encouraged to explore the hard questions of faith without fear of criticism. We are persuaded by Scripture that lesbian, gay, bisexual, and transgender people are beautiful creations of God, who are invited to live in communion with God on the same basis as all other people. We are also persuaded that women should play an equal role in the church. We are the only Christian denomination where women comprise more than half of all ordained clergy. 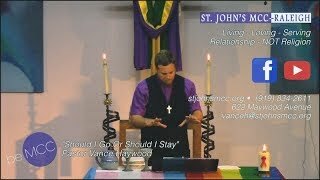 We believe St. John’s MCC is called to be a prophetic voice sharing the Gospel and advocating justice for all, including lesbian, gay, bisexual, and transgender people, as well as women and other minorities. We are committed to encouraging one another to live out the Christian faith from day to day in every aspect of our lives. There is a place at God’s table for you here!